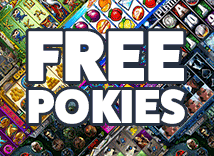 This section covers some facts about the pokies in Australia and about video slots in general. We also discuss the reason and show you why there is really no way to be a long term winner if you play slot machines over an extended period of time. Quite simply the more you play the more you lose. The most important fact to keep in mind when playing slot machines is that they all have a payout percentage of less than 100%. Any gambling game with a payout of lower than 100% will eventually lead to you losing all of your money if you play long enough. While some players will be short term winners only those that win massive progressive jackpots or win a big amount and never play again will be long term winners. The next thing to keep in mind is that every spin is random and is in no way changed by the previous spins. Each and every spin has the same shot at winning the top jackpot or any other prize. This means that even if you have lost on a machine for a long period of time that there is absolutely no guarantee that the game will start to pay out. There is no way to win on the pokies in the long term. This is made somewhat worse for players in the fact that the maximum win in a pub is $10,000 per spin which is very small compared to the odds of winning. Considering the odds of getting a win this big are roughly 2,500,000 to 1 the actual win is really quite small. You have roughly the same chance of winning the lottery where you will get a much bigger prize. Who really wins? Clearly the players are not the big winners so who are? The answer is the gaming operators (Pubs, Clubs, Casinos) and the biggest winner of them all is the government who collect billions every year as gambling taxes - a much bigger prize.